King William I of Prussia and his Chancellor Otto von Bismarck were the two central figures in German unification. Both agreed in the idea of unifying Germany and limiting the power of Austria. Prussia defeated Austria at the Battle of Sadowa in 1866 controlling the north of Germany which was annexed to Prussia. Prussia obtained Alsace and Lorraine after defeating France at the battle of Sedan in 1870 which meant the unification of the South of Germany. In 1871 the Second Reich or Second German Empire had begun. Germany had a federal political system. 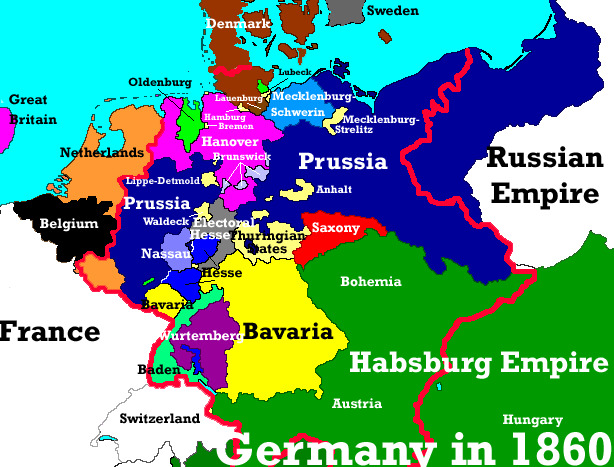 States forming part of Germany had extensive powers.